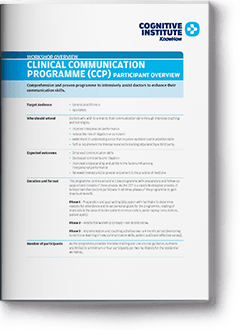 The Clinical Communication Programme (CCP) is a highly intensive, interpersonal skills training programme proven to greatly enhance communication skills and create significant behavioural change. Designed to support professional development needs, the CCP helps improve the performance of individual doctors. 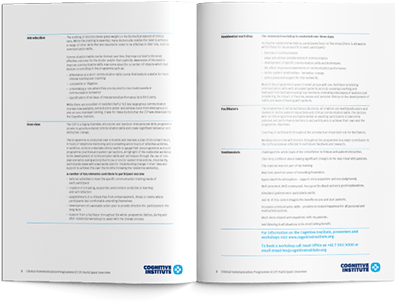 professional standards for patient engagement and decision making. The programme engages with evidence-based educational research and best-practice training techniques, including simulated patient interactions. Designed to equip doctors with the tools to manage challenging interactions, the CCP is colleague-to-colleague, highly intensive, confidential and supportive. The Clinical Communication programme is conducted over 6 months and involves a total of 20 contact hours, 4 hours of telephone mentoring and counselling and 6 hours of reflective activities. In addition, doctors undertake clinical audits to gauge their pre-programme and post-programme practices and patient perceptions. The Clinical Communication programme is facilitated over three phases, conducted over six months. It includes a three day weekend residential followed by monthly mentoring sessions. This programme provides intensive training and one-on-one guidance, so numbers are limited to a maximum of six participants per two facilitators for the residential workshop. The CCP is a three-phase programme consisting of a three day residential with preparatory and follow-up support. It is important that doctors participate in all three phases to gain maximum benefit. The CCP programme is led by facilitators (doctors) who are leading educators and trainers in doctor-patient interactions and clinical communication skills. They are highly skilled at assisting participants to overcome personal and performance barriers and help them achieve their own and the programme objectives. Coaching of participants throughout the process is an important role for facilitators. Working one-on-one with doctors throughout the programme is a major contributor to the CCP’s success as reflected in participant feedback and research. This programme is ideal for doctors who need to strengthen their communication skills, improve interpersonal skills, undertake a role that requires excellent communication skills, reduce risk of litigation or complaint, or fulfil a requirement for interpersonal skills training stipulated by a third party. The CCP is a highly intensive, structured and hands-on interpersonal skills programme proven to greatly enhance communication skills and create significant behaviour and attitudinal change. Doctors will develop communication skills and techniques using roleplay scenarios that focus on doctor-patient interactions. Conducted in small groups with one facilitator practising communication skills with simulated patients (actors), participants receive coaching and feedback from facilitators and group members. They also review videos of sessions and consider the impact of theories, values and personal history on the development of habits and ways of dealing with patients. Importantly, participants leave with a workable plan for implementing change in their lives and support to achieve this over the months following the residential workshop. Support from a facilitator throughout the whole programme (before, during and after residential workshop) to assist with the change process. Please contact us to find out more about the costs for this programme. Comprehensive and proven programme to intensively assist doctors to enhance their communication skills. The training of doctors places great weight on the biomedical aspects of clinical care. While this training is essential, many doctors also realise the need to enhance a range of other skills that are required in order to be effective in their role, such as communication skills.